Imagine a hotline you could text at any time of the day to magically complete your homework for you. Yes, we’ve all had those fantasies. 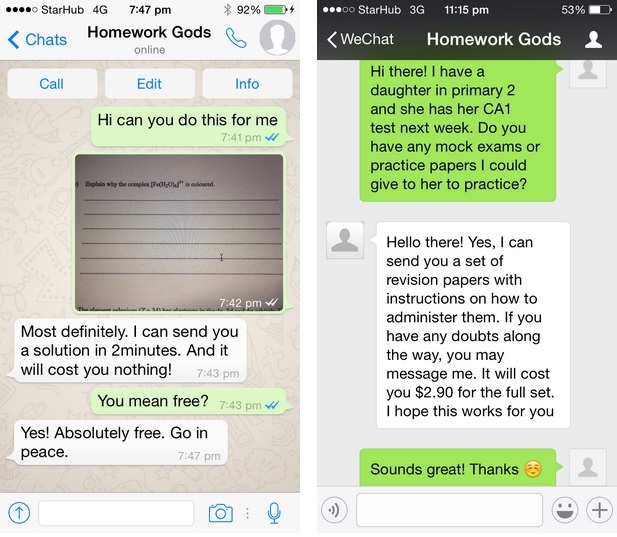 Now imagine no more, for the Homework Gods are here to save your miserable, homework-laden day. Their service covers anyone who needs help with homework, be it “doing homework, creating homework, or marking homework”. We just hate homework, and someone finally understands. 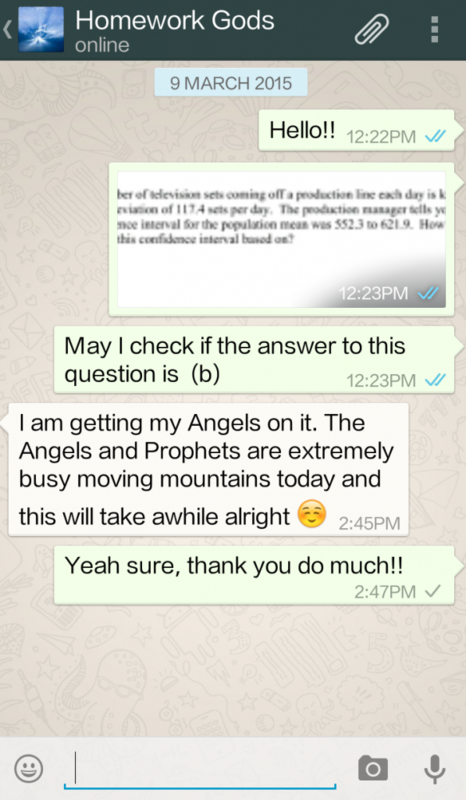 The magic hotline works on Whatsapp, WeChat, Line and Viber. 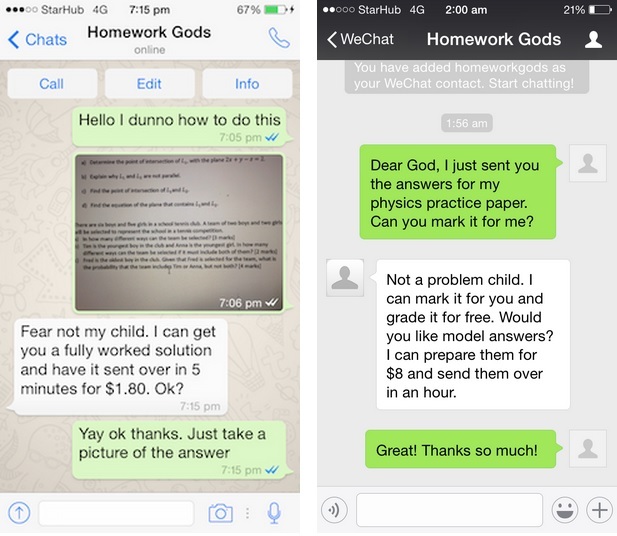 Simply text +65-91227983 or search for their User ID: homeworkgods to get in touch. The Homework Gods provide help across all levels, subjects and disciplines, and promise to deliver high-quality results for each question posed. They promise a prompt delivery, too, because “God made the universe in 7 days”. Look who’s got an out-of-this-world sense of humour. And as if the deal wasn’t sweet enough already, the Homework Gods charge close to nothing for the quality service they promise to deliver, at times even for free. Speaking to them won’t cost a dime, but rates appear to be subject to the demands of your request. For the life-saving service they claim to deliver, we’re not complaining. Talk about a student’s dream and a tuition teacher’s worst nightmare. Homework? 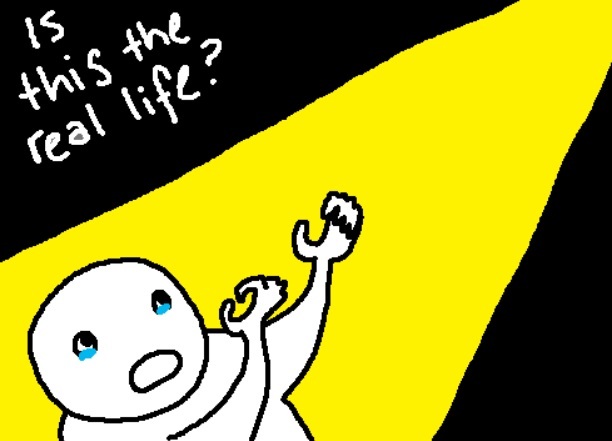 UPDATE: We sent a university-level statistics problem over to the Homework Gods on March 9. To acknowledge the query, they replied, “I am getting my Angels on it. The Angels and Prophets are extremely busy moving mountains today and this will take awhile alright (:” They have so far yet to provide the solution. Do check back for further updates; even gods take time to do homework.